Enjoy a one-stop-shop for all of your writing needs using Ginger Page for Chrome Extension. Write great English in Facebook, Gmail, Twitter and other sites with the world’s leading writing extension for Chrome. 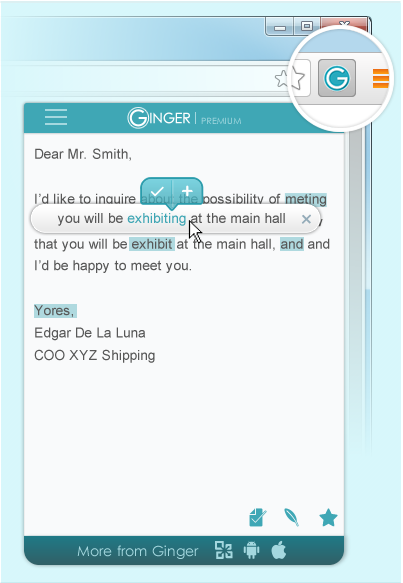 Ginger Page includes a cutting-edge proofreader, a sophisticated rephrasing tool as well as translations, contextual synonyms, definitions and more! A window will pop-up asking you for permission to add the Ginger Chrome extension. Click 'Add', and you're done! A non-intrusive correction tool that offers you live corrections as you write your text in Gmail, Facebook and your other favorite websites. This tool highlights your spelling, grammar and punctuation mistakes and enhances your text with alternative phrasings. A one stop shop tool you can access by clicking the Ginger Page icon. This tool offers you a cutting-edge solution for all of your writing needs with a grammar and spelling proofreader, rephrasing tool, translations between 40 different languages and contextual definitions and synonyms!